I stand next to the window with a cup of coffee warming my unusually cold palms. The steam rises from the hot cuppa and fogs my thick black rimmed glasses perched on my nose threatening to fall on my nose tip any time. I rub the glasses with the maroon woollen shawl with delicate Kashmiri floral prints that I am wearing, a gift from my Doddappa on my wedding. 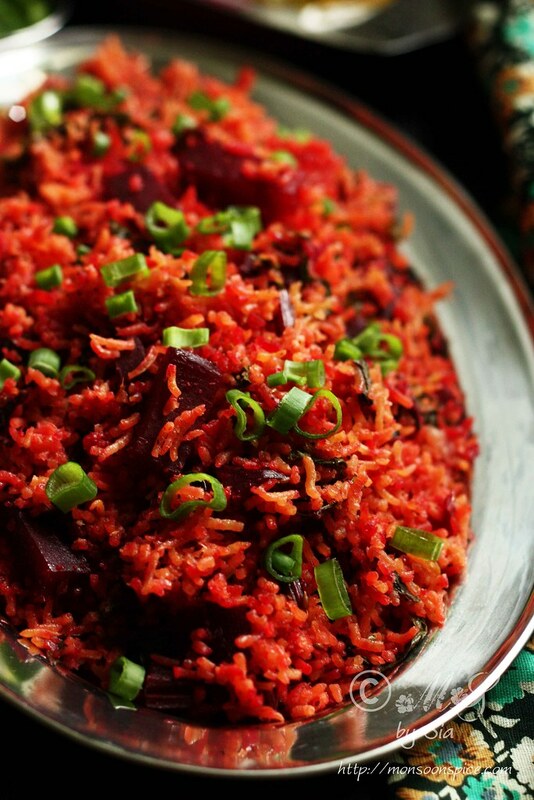 Beetroot and beet greens PulaoPulav/Pilaf ~ Ruby studded! Through the clear glasses I gaze through the window at the stark brown landscape. The season is somewhere between autumn and winter as the golden yellows and amber and fiery oranges and reds of the leaves have lost their sheen to rusty browns. Most of the leaves on the trees have disappeared leaving behind bare black branches. Twittering and pottering birds of summer have left nests which now jots out like a sore thumb. They look lifeless between the leafless empty branches of trees. Winter can be harsh and the most depressing season in England. We are flying to India tomorrow. We are leaving the wintery England of -5 deg C to wintery India of 30 deg C! Winter in India feels like what summer feels like here in England. Back home the winter is when the dawn is lightly touched with frost and the sun turns honey gold. It is the season of silky sunlight, blossoming trees and shivering anticipation of starlit evenings! The trees straighten up as the soft new light touches the leaves... Yes, back in India the tress are still full of leaves and the season is full of promises! For the next few weeks we will hang our thick coats and jackets and stow away the boots only to happily walk around in flip flops and soft thin cotton dresses! I promise to come back with bagful of recipes, photographs, memories and anecdotes. We are going home after 2 years but it feels like it’s been a very long time... and may be eternity! It is Lil Dumpling’s 3rd time visit to his parents’ home. We hope that he gets to taste little bit of our own childhood days. This time it will be little different for him unlike last two times where he was too young to understand the bubbling excitement of visiting grandparents, family and friends. It is one thing to see and talk to his grandparents on Facetime and it will be whole new experience for him to bathe in their love and affection and be spoiled rotten by his uncles and aunts! As I run around doing last minutes shopping and packing our bags, I thought of quickly sharing this recipe for Beetroot and Beet Green Pulao. 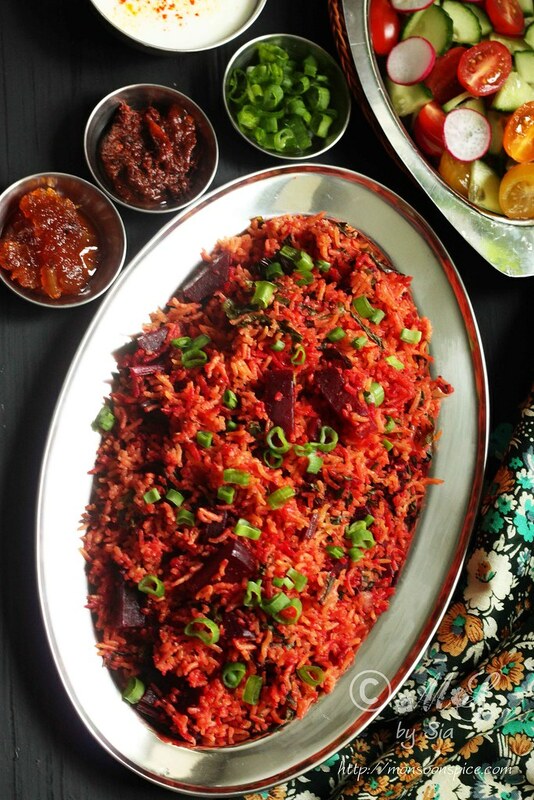 This Beetroot Pulao or Pulav or Pilaf is a simple one pot meal that I cook very often when I am in hurry or have run out of ideas for dinner menu! 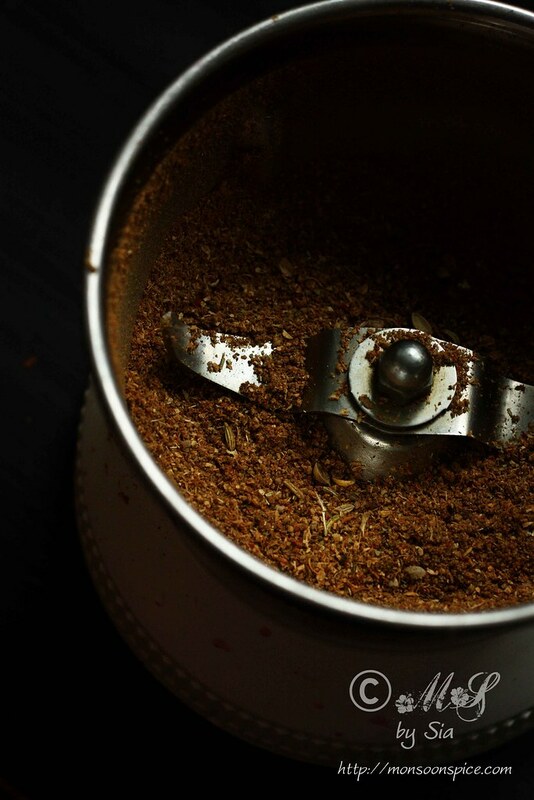 I make my own Pulao Masala Powder from scratch by roasting selected aromatic spices and then grinding them in my trusty old mixer grinder. There is nothing better than freshly ground most aromatic and flavourful Pulao Masala Powder. But if you are short of time or don’t have patience or ingredients to make your own, you can simply use the store brought Pulao Powder or Garam Masala. When hubby brought these gorgeous Beetroots with glossy Beet Greens from local farmer’s market few months ago I didn’t have the heart to throw it away. 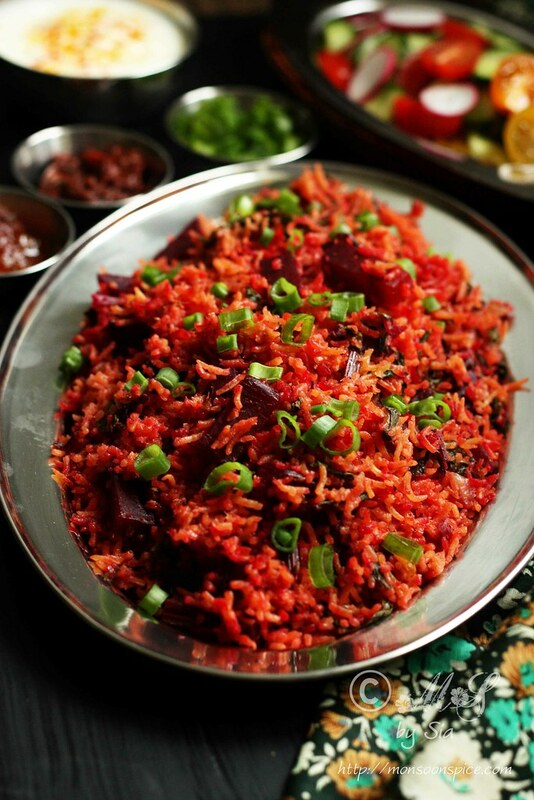 Usually I would have ended up making this Beetroot Kodhel, a delicacy from Udupi-Mangalore. But instead I decided to make this Beetroot and Beet Greens Pulao on a whim and it was the best decision ever! 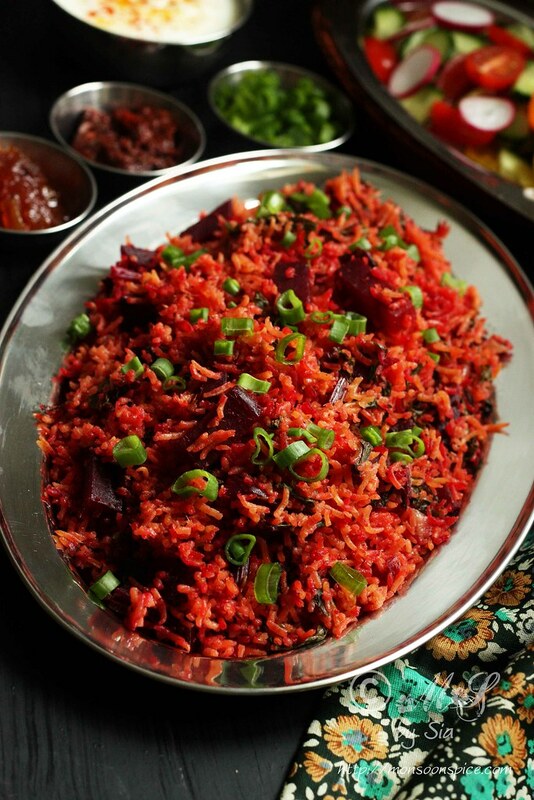 Ever since we tasted and fell love in with this delicately flavoured Beetroot Pulao with Beet Greens, this Pulao has been on our dinner table once in every fortnight and we continued to love and enjoy every single mouthful of it. 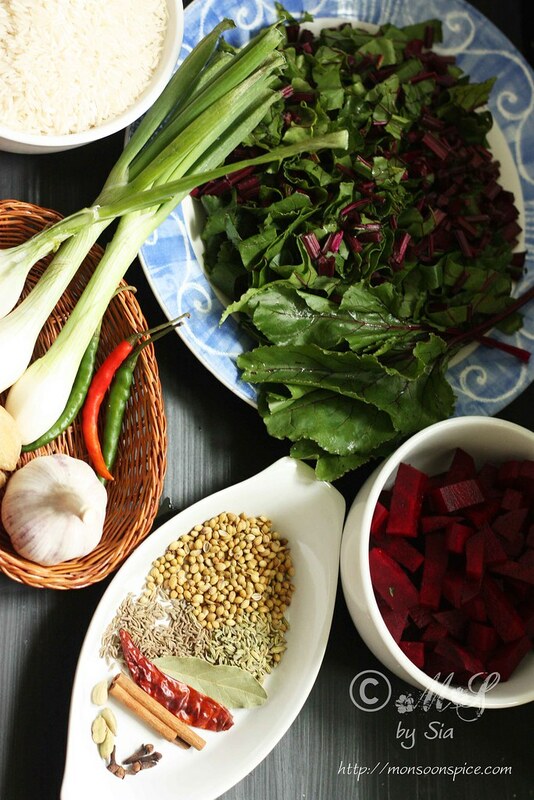 Generous amount of beetroots and their greens flavoured with coconut milk and delicately spiced with freshly ground homemade Pulao Masala Powder is tastes so good that you have to try it yourself to see it. :) If you can’t get hold of beet greens, simply use spinach or fresh fenugreek leaves and it will taste equally good and nutritious. 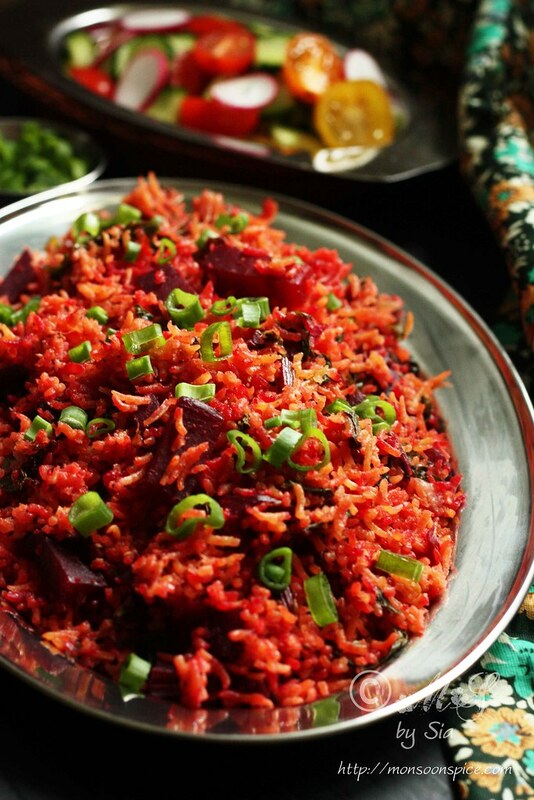 Do give this Beetroot and Beet Greens Pulao a try and see if you fall in love with this bright coloured and flavourful rice dish. Dry roast cinnamon stick, cloves and cardamoms on medium to low flame for a minute. To this add cumin seeds, fennel seeds and coriander seeds and continue to roast it on medium to low flame for a minute. Turn off the flame and add bay leaf and set it aside to cool down completely. 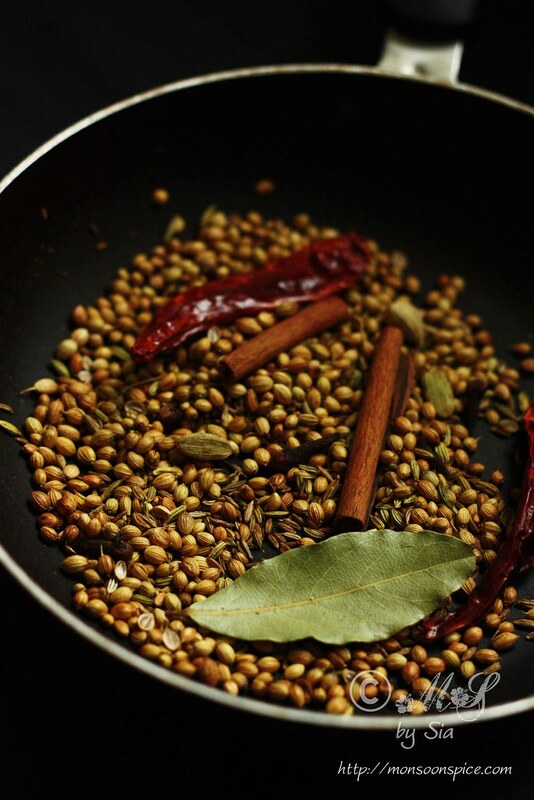 Once the roasted spices cools down to room temperature, grind them to smooth powder in a spice grinder or mortar and pestle. Keep it aside until needed. You can store this Pulao Masala Powder in an air tight container for up to 3 months in cool and dry place. Wash rice 3-4 times and soak it in 2½ cups of water for 10 minutes. Keep it aside until needed. Heat oil or ghee in a pressure cooker or large heavy bottomed pan and once hot, add sliced onions and green chillies if using. Fry the onions on medium flame until they turn brown on the edges. 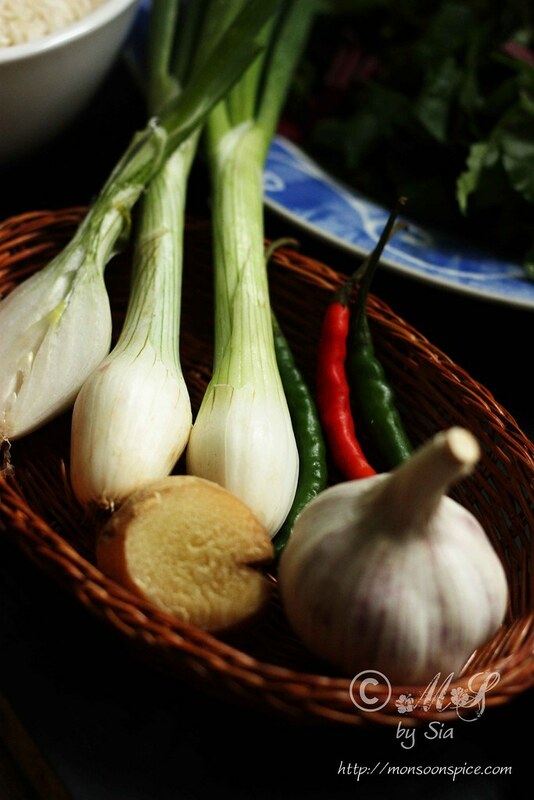 Mix in ginger-garlic paste and fry it for a minute or two until the raw smell disappears. Next add the freshly ground Pulao Masala Powder and give it a quick stir for half a minute. Mix in rice along with the water in which it was soaked and coconut milk or diary or non-diary milk along with beetroot, beetroot greens and salt to taste. Mix them all well. Cover the lid and let it cook undisturbed for 20-25 minutes. If using the pressure cooker, cover the pressure cooker lid and place the weight and let it cook on medium flame for 3 whistles or for around 17 minutes. Let the pressure release completely before opening the lid. Once cooked through, fluff the rice with a help of a fork or spoon. 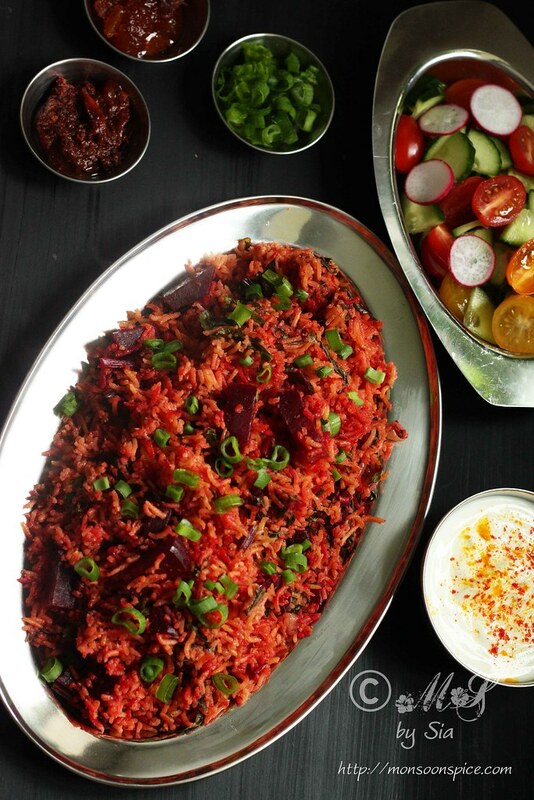 Serve this delicately spiced Beetroot and Beet Greens Pulao garnished with the greens of spring onions or coriander leaves with pickle or raita or plain yogurt or on its own and enjoy! You can double the quantity of the ingredients used for making Pulao Masala Powder and save it for later. It stays fresh in an air tight container for up to 3 months in cool and dry place. There is nothing better than freshly ground most aromatic and flavourful Pulao Masala Powder. But if you are short of time or don’t have patience or ingredients to make your own, you can simply use the store brought Pulao Powder or Garam Masala. 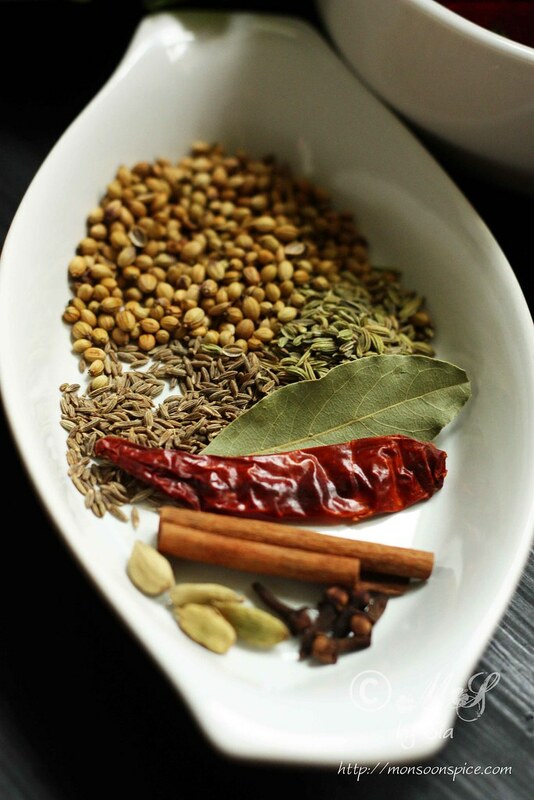 Use about ½ tbsp to 1 tbsp of store brought Pulao Masala or Garam Masala for this recipe. 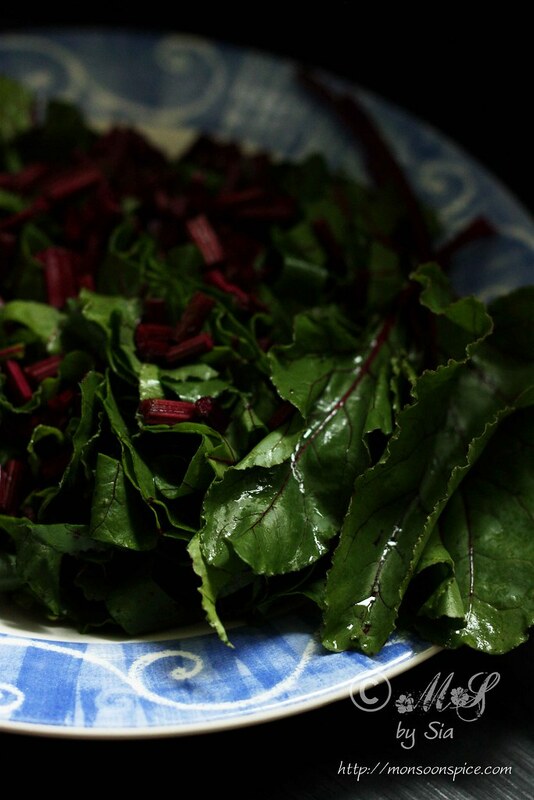 If you can’t get hold of beet greens, you can replace it with any greens of your choice. Spinach or fresh fenugreek leaves will taste equally good. You can add any other vegetables of your choice in place of or along with beetroots. I have used mixed bag of assorted vegetables like potatoes, carrots, cauliflower, green peas, sweet corn etc along with beetroots on different occasions. A fantastic pulao! 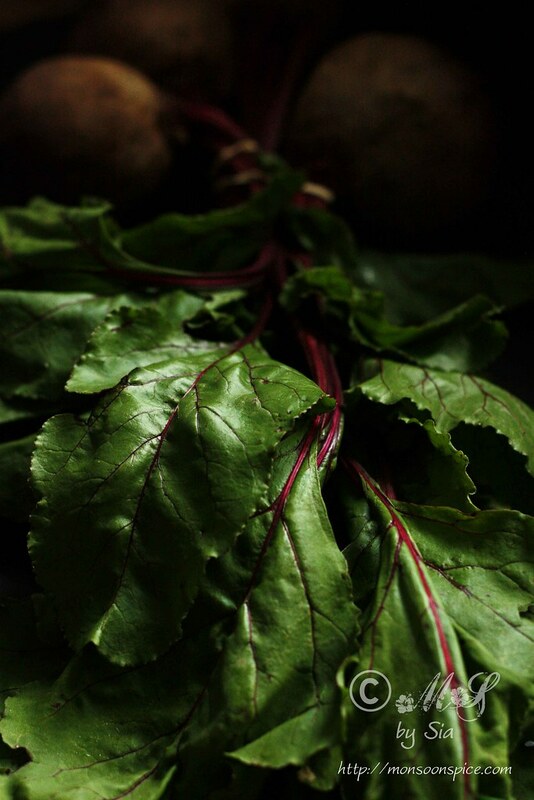 It contains three of my favorite things (beetroot, beet greens and spices). What a fantastic looking puloa, the color and the spices are so perfect. amazing food blog...and artistically photographed presentations! too good! Beetroot puloa looks so tasty! Thank you so much for sharing so many plant-based recipes- good for health and environment. 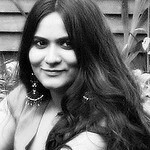 You have a great website and very well maintained for such a long time..Being new to blogging, I know the efforts put behind each blog post...Continue posting many such wonderful recipes n great photography !! This pulav is really unique and comes out very tasty .. Thanks for sharing this recipe. I have re-blogged it in my site. Thanks! Loved this pulao. Such wonderful flavors, a hint of coconut with the sweetness of beets and warmth of the masala. Perfect!